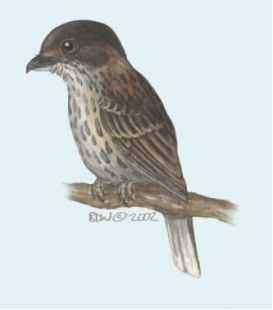 Physical characteristics: African broadbills are stocky, short-tailed birds with a distinctive broad, flat bill. 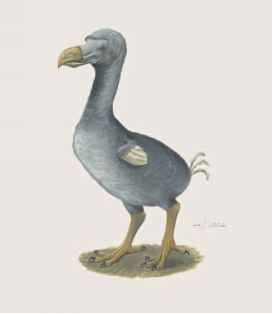 They have a brownish head and upperparts, and buffy underparts that are streaked with blackish colors. Males have a black crown (top of head), gray lower nape (back of neck), black upper mandible (top part of the bill) and whitish lower mandible (bottom part), and reddish brown upperparts and tail. The mantle (back, inner-wing, and shoulder area) has broad black streaks. White under-parts are deeply streaked with black except on the central belly and rump, and the legs are olive to yellowish green. Females look like males but are duller overall, with a gray crown that has black streaks. Juveniles look like females but with less buff on forehead and a brown crown with faint streaks. Adults are 4.7 to 5.5 inches (12 to 14 centimeters) long and weigh between 0.7 and 1.1 ounces (20 and 31 grams). Geographic range: African broadbills are found in various scattered spots in central and southern Africa including Cameroon, Gabon, Central Africa Republic, Sierra Leone, Liberia, Ivory Coast, Ghana, Malawi, Democratic Republic of the Congo, Tanzania, Kenya, Zambia, Mozambique, Rwanda, Uganda, Angola, Namibia, and South Africa. Habitat: African broadbills inhabit the under-story (lower vegetation of a forest) of primary and secondary forests, dense deciduous thickets, montane forests, riparian forests (along or near banks of rivers), a variety of woodlands and savannas (flat grasslands), and open agricultural lands. They are usually found at elevations below 2,300 feet (700 meters), but can be found as high as 8,000 (2,440 meters). Diet: Their diet consists of insects such as caterpillars, butterfly eggs, and ants. They often rush forward to snag prey, sometimes even falling to the ground in order to capture food. Behavior and reproduction: African broadbills are territorial birds. Both males and females perform elliptical display flights. During courtship, both birds face each other on a horizontal branch and flick their wings, changing between perching and hanging positions. Their call is a "twee-uu," probably to keep in contact with other birds and to show alarm or distress. A whistled "huiii" and a mewing-like call are used during courtship. They build a bag-like nest of plant fibers, dead leaves, moss, and twigs with a rough-looking hanging tail. An entrance is made high on the side. The inside of the nest is lined with soft bark, dry stems, leaves, and grasses, and kept together with spider silk. Their breeding season varies depending on where they are located. Females lay one to three eggs.